Drizzle canola oil in a cold skillet or on the surface of an electric griddle. Turn the heat on to a medium high setting. Place the corn tortillas on the griddle, Sprinkle first with grated cheese, then with spinach leaves and chopped roasted red peppers. 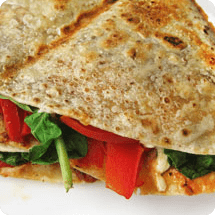 When the cheese has melted and spinach leaves are wilted, fold each quesadilla in half. Remove them to a cutting board and cut in wedges. Nutrition (per serving): 84 calories, 4.3g total fat, 79.1mg sodium, 7.1g carbohydrates, <1g fiber, 4.6g protein.